Cinthia is the best tour guide we have ever had. Extremely knowledgeable, and polite . Highly recommend her. We had an extraordinary time with Cynthia. The details she shared for all of the sites was amazing. We were sad when the tour ended. Our tour guide was Cinthia Ramirez who was fantastic. She was very knowledgeable, patient, pleasant and just made this a wonderful memorable experience. She spent the whole day with us and explained the history of each of the places we visited. We had our 8 year old son with us who also had a wonderful time. I would highly recommend this tour. Cinthia was hands-down the best tour guide I have ever met! She was professional, friendly, and made visiting the highlights of Paris much more meaningful than if we had done it on our own. What a Magnificent Private Tour with Cinthia Ramirez as our guide. Her knowledge about Notre Dame, Louvre and our tour to Montmartre went way above what we expected. It was sad to say goodbye at the end of the tour. We will definitely do another private tour and ask for Cinthia when we return to Paris. The tour was excellently planned out and our guide was simply amazing. We were keen to learn and she was knowledgeable and talked with enthuisiasm She made the day very enjoyable and we would use her for any of the other tours she was guiding. Our personal guide was Cinthia and she is a wealth of knowledge on art, history, culture, and the city itself. We started at Notre Dame and took time learning about the architecture, the history, and other interesting facts. On our way to the Louvre, we saw several more historic buildings, sites, and hidden away squares. 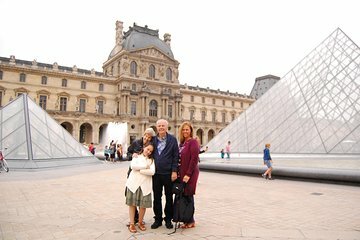 At the Louvre, Cinthia did an extremely thorough job building our awareness of the historical significance to each work of art. We could have easily spent more time there, but our three boys needed a break. We had lunch outside and then decided to alter the trip. Instead of going to Montmartre, we continued on a walking tour to the Arch de Triumph that eventually led us to the other side of the Eiffel Tower. Throughout the entire trip, Cinthia was flexible and respectful of how much the boys could handle. The entire day was 7 miles of walking, which we fully expected. Make sure you have comfortable shoes and dress for the weather! I'd definitely recommend Cinthia for her extensive knowledge and her love of art. Take this tour if you love history, details, and walking. We had a good experience because our guide was Cinthia Ramirez and she tried very hard to please us. One of the good things about to have a personal guide tour it is you can be more flexible in your requests and organize your time differently and if you want to stay a little longer in a place you just tell your guide. Cinthia is very knowledgeable about Paris and she is well prepared and brings a folder with her to explains things to you in a way it is simple. Remember there is a lot of information to process, still you don't need to remember all but have an idea of how things have evolved. Paris is a museum itself, you will only grasp a little bit of it and you need to come back many times. She not only speaks French but English and Spanish too so she can host many different kind of customers or multi cultural families too, so that it is a plus! Also she was an art teacher so she knows a lot of art and can explains things that are hidden for the eyes of the most of us. Ask her about tips to move along in the city, also she was unbelievable helpful with the Metro stuff that it was confusing for us at the beginning but then we used it as our main transport way. I suggest to hire her at the beginning of your trip so you can take advance of her knowledge. And remember, part of to have a good experience is to have a good attitude, just blank your mind of what do you expect or get ride off your prejudices and just enjoy it in the way it is presented to you. I am an experienced traveler and I can't remember if never had a problem, and if it was I focused in the solution. I highlight this because I read people complaining about the long lines, the service, the waiting, the crow, etc. When you travel abroad there are things in each of the places you visit that are characteristics of those places, it is a fact of life, as soon you accept that you cannot change anything outside yourself and that you cannot control your surroundings you will be happier, of course we can use some strategies that are better than others, for example be aware of the short and dark hair ladies who walk around with a folder and want you to sign stuff but they want to go for your wallet gypsy girls so be assertive always, with just a NO and continue walking is enough. We don't travel to be comfortable or do the same things we do at home, if not, stay at home. We travel to be challenged, and when you come back home, you are richer, and grew as a person, so if that doesn't happen maybe you were looking to the wrong screen. Paris it always will be Paris so enjoy the ride!